It’s a fact. Meetings are the Single Largest Waste of Time. And one of the most common complaints I hear from managers is “I don’t have enough time to do my work because I spend too much time in meetings”. So if you’re dead set against adding weekly one on one meetings with staff to your already busy schedule then I don’t blame you. Because weekly one on one meetings with each and every member of your team sounds like it would take a lot of your precious time. But the Secret Benefit of Effective One on One Meetings is that they will actually save you time. Once you start running regular, high quality one on ones you’ll find that you have more time freed up to focus on more important priorities. Once you start effective One-on-Ones you’ll soon realise how they save time. But the question is how do you find the time to invest in the first place? This is how to turn good intentions into reality. 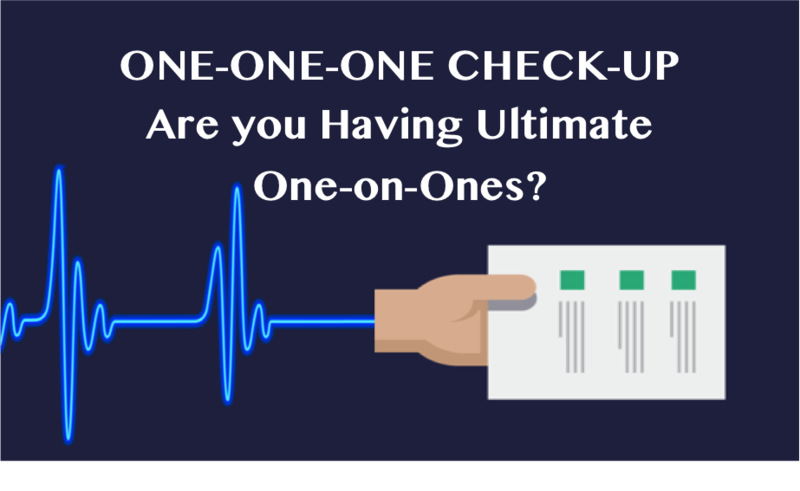 One of the reasons why one on one meetings with staff are the Heartbeat of Managing is because they are scheduled regularly. And it’s their consistency that keeps your employees moving forward - and you moving forward. But of course, the best intentions don’t mean anything unless you put them into practice. And that means going to your diary and booking time for weekly one on ones with each of your direct reports. Now I know that if I look at my diary right now the week ahead is pretty jam-packed. I’m sure yours is too. And I’ll bet that your employees already have busy schedules for the coming week too. Initially it may be difficult to find time in a busy schedule. This is standard for most managers. The trick is that most managers have got time available the further you go out. Doing one on ones is better than not doing them at all. Even if it means starting three weeks from now. The sooner you get them booked, the sooner you can start. To kick your employees into action, you can motivate them with scarcity and social conformity. Send out a group email with your available time slots. You will need as many time slots as you have direct reports and I suggest adding in a contingency of 50% - because it’s unlikely that diaries will exactly line up. This means if you have 6 direct reports, send out 9 potential time slots. PS want an invite email for your employees? Get one here. As soon as the first employee selects a time-slot, email the rest saying the first slot is gone. When employees see other employees booking slots they will quickly do the same because people follow other people and don’t want to lose out on the best time slots. PS: Super user tip: So your employees know what is expected of them and to get them motivated to appreciate One-on-Ones, give them this free online video training. … then they will start saving all their communications for you until their weekly one on one. But this won’t happen unless you have the time scheduled in advance. I’ve found that meeting on an ad hoc basis is much more painful and less effective. Don’t waste time; simply book a recurring meeting at the same time, on the same day every week. Remember that managing is a practice - it’s the regularity of the practice that produces results. Those managers that believe it’s more efficient to have one-on-one meetings “only when they need them” are fooling themselves with a false economy. Don’t get thwarted by good intentions that never materialize. Starting is often the hardest part but when you put it into your diary it’s much more likely to happen. Once you’re going, don’t lose momentum by making them a regular practice. What's your experience with one on one meetings with staff? Please help the rest of us out by sharing in the comments below.